Bam Bam's Cannoli Cookies & Cream Cannoli Review - Daily Vaping Deals & The Best Vape Product Reviews at Vaping Cheap! 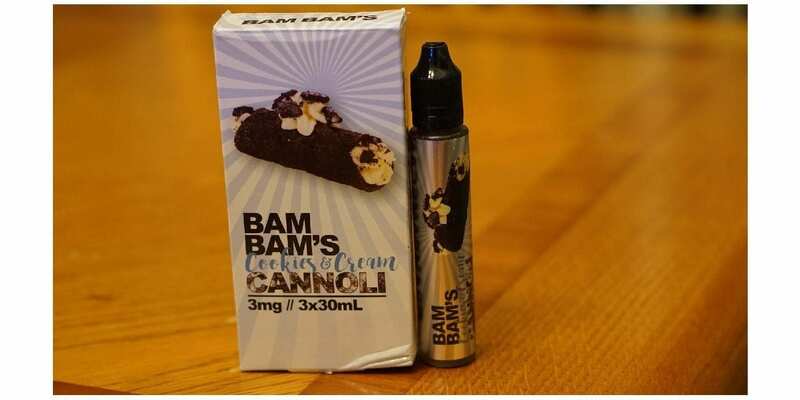 In this e-juice review, I will be reviewing Bam Bam’s Cannoli Cookies & Cream Cannoli. This e-juice comes with three 30ml unicorn bottles, giving you a total of 90ml. In addition, this e-liquid is priced quite fairly in comparison to other premium e-liquids, which is a huge pro! Firstly, I would like to thank Fuggin Vapor for sending this e-juice my way for review. I will give you my overall thoughts on this e-juice and will conclude with whether or not I recommend it! In the next section, I will go over the specific atomizers and mods used in order to test Bam Bam’s Cannoli Cookies & Cream Cannoli. Flavor Description: Bam Bam’s Cookies and Cream Cannoli is a delectable cream filling encased in a cookie crust layer of pure tastiness, finished off with a hint of homemade whipped cream. It tastes so much like your favorite cream filled cookies that you’ll want to dip the bottle in a glass of milk. This is a really nice flavor, and certainly captures the cookies and cream flavor it’s described as. On the inhale, you get a nice cream flavor, and it is followed by a hint of oreo. However, on the exhale you get a very nice creamy oreo flavor that is surrounded by a bakery note. I assume the bakery note is the cannoli, but honestly, it does not really taste like a cannoli. However, the cream note is really great, and certainly tastes like the cream of an oreo cookie. The cookie flavor is done well too, and has a chocolate taste to it. On the tail end of the exhale, you do get a nice chocolate finish, and really completes this e-liquid in my opinion. There is a very faint hint of a cookie flavor present, but just like the cannoli flavor, it’s something you would have to look for and is not noticeable at first. Not to mention, the throat hit is pretty smooth as well, and I did not notice any burning or stinging while vaping. I do want to mention that this e-liquid is sweet, and definitely not friendly to your coils. Typically, I can go about 2 days or so before I would have to change my cotton. I personally enjoy sweeter e-liquids, and don’t mind changing cotton often, so this wasn’t a huge deal for me. However, I know there are some vapers who really dislike e-liquids that destroy coils, so it’s certainly something worth mentioning. What is great about this e-liquid though is that it comes with three 30ml bottles, giving you a total of 90ml. I think it’s better to have the total amount of e-liquid split into smaller bottles, as it just makes it much more convenient to carry with you. All in all, this is an excellent vape, especially for those vapers who enjoy cookies, cream and/or chocolate flavors. If these are flavors you enjoy, I definitely recommend giving Bam Bam’s Cookies and Cream Cannoli a try! Click Here to Check Out Bam Bam’s Cannoli Cookies & Cream Cannoli!